A great example of this is the children’s library; an exuberant and entertaining space with extensive reading materials and activities, led by staff members for the children and their parents to enjoy and participate in from, colouring and creative activities to reading sessions. The Children’s Library is an opportunity for university students to gain knowledge and experience from staff members, who are versatile in their approach and open to questions. The teaching resources are obtainable from the children’s section Teaching Collection for use in schools or with your kids at home. The children’s section itself, offers fantastic opportunities for students with young children who need a fun and exciting distraction for them whilst they work on their assignments or any other tasks. The computers in the Children’s Library are just for children younger than 13 years of age. Students studying Education, Early Childhood, Illustration and Creative Writing will find the children’s library beneficial to their education as the research possibilities are numerous. Students are encouraged by staff members to use the books as the county stock and university resources overlap to provide potential ideas, perceptions and research for assignments. Reading groups are provided for children interested in books and one such groups is ‘Chatterbox Group’. This occurs every second Monday of the month and is aimed at children aged 8-12 years although, staff allow younger siblings who may want to join in. This is a great opportunity for students interested in children’s literature or teaching as staff allow them to observe or possibly join in as long as prior permission has been obtained. 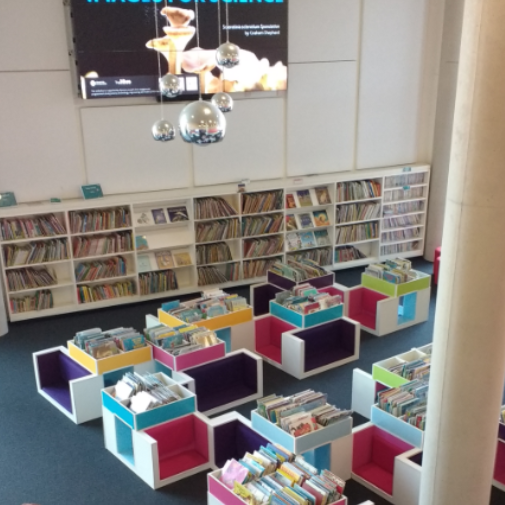 Overall, the children’s library at The Hive is a brilliant educational space for University of Worcester students, who can utilise resources effortlessly.